... is to bring it to Kinko's! They have an incredible machine that can cut through a stack of paper in a single motion. It's perfect for making custom size books. I printed a bunch of pictures—two 5" x 7"per page—straight from iphoto and brought the entire stack to Kinko's, where they cut borderless right around the top photo. I waited until after I spiral bound them to get the right edge trimmed off. I bound the books with a 1" silver spiral binding at my boyfriend's office and then bought them back to Kinko's. 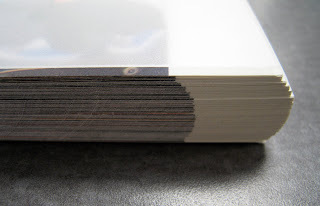 After they are spiral bound, the right edge emulates the curve of the spiral so pages aren't flush. So it's better to do the final cut after it's bound. This simple photo album is a great way to actually look at your photos, archive them with a hard copy, or makes a great gift for a friend. 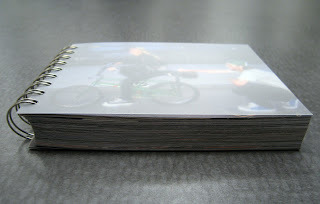 Printed fast on a laser printer on a medium weight paper with a frosted plastic cover, you can have an album that stores about 150 precious moments. First, this awesome pendant that my dear gave me a few Christmas's ago. 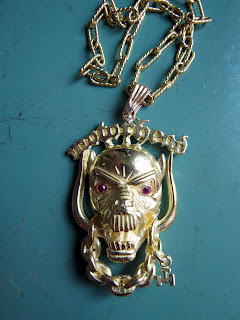 Motorhead's Warpig: 18k solid gold with ruby eyes. The best present ever! And also the reason I named my blog "lemme make it" and not "let me make it". 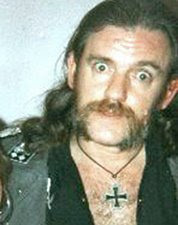 Perhaps Motorhead's Ace of Spades had an effect on me? 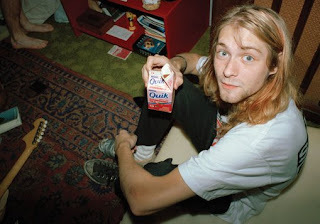 It's too bad Mr. Kurt Cobain's name doesn't belong to him anymore. I would have named my polar blog Cobaineit. Let's not make it, let's destroy it! Cheers to Lemmy and to Kurt. How about tie dye with bleach! 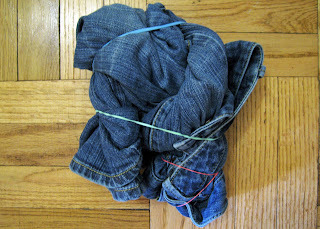 So I tied the legs of the jeans in a knot and put a few rubber bands around them to keep them in a tight bundle. It took a little over an hour for them to turn almost completely white. 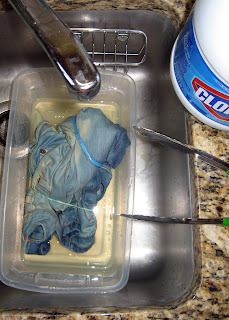 I rinsed them as best I could with detergent and let them hang dry. When I was ready to do laundry I put them in by themselves, so I didn't give my whole wardrobe a new look! 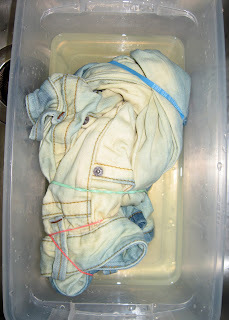 So obviously, how the final product turns out depends on how you tie the jeans up and rubber band them. The front of mine came out more bleached than the back, which shows a little more of the original denim color. 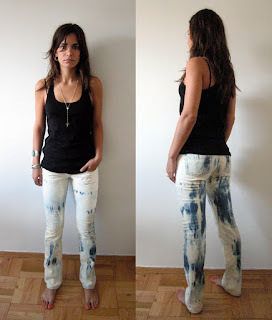 Pretty fun experiment and I like the jeans better then I ever did before! 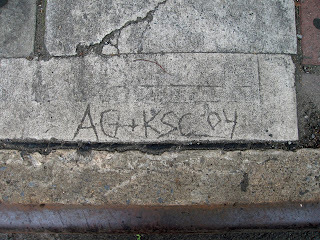 My boyfriend Ashley and my initials from 5 years ago! My god, I totally forgot we ever did that! Oh Ashley pants... it's been a while! I saw this sitting on my shelf this morning and it made me smile. I couldn't resist buying it from the Salvation Army a few months back for $1. 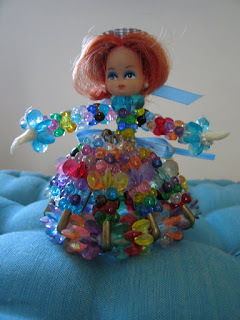 Someone made it out of some safety pins and pipe cleaners covered with plastic beads and attached the miniature doll parts. 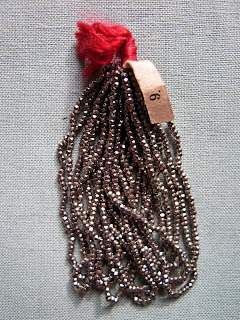 Imagine the beads were crystals... it could be pretty fabulous! Check out my post on the craft department blog about the Crystallized Swarovski store opening. With some scraps of sterling chain, a jump ring, an ear wire, and a sliver of leather, Melissa designed and had me make her a pair of earrings. Easy. 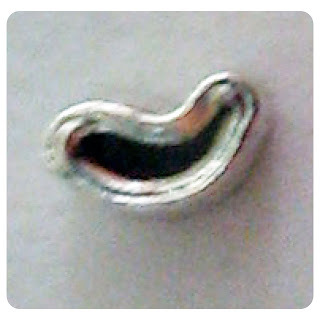 I attached various lengths of random silver chain to a single jump ring, which I then attached to an ear wire. With a thin strip of black leather, I wrapped the jump ring to hide it and secured it with a dab of fabri-tac. Rock them with jean shorts and a white tee or a cute black dress. Done. 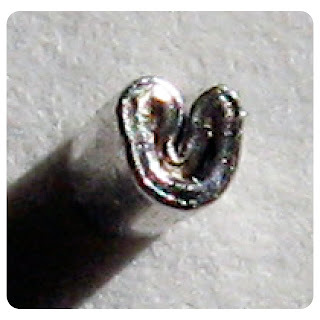 This wire cannot be tied in a knot, so the only way to secure the ends are to use crimp beads. To get the best results with a crimp bead, I recommend investing in crimping pliers. 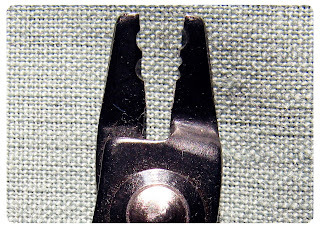 Crimping Pliers have two oval notches or grooves on their nose, one with a dip and one without. 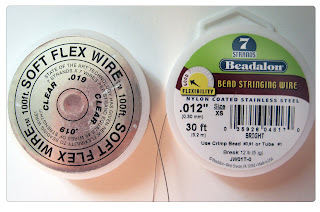 Crimp beads are great alternatives to knots on string as well, but are a necessity for beading wire. Happy crimping! The Sunday before the July 4th weekend, we rode our bikes over the Manhattan Bridge into Dumbo, to see what was happening at the Brooklyn Flea. 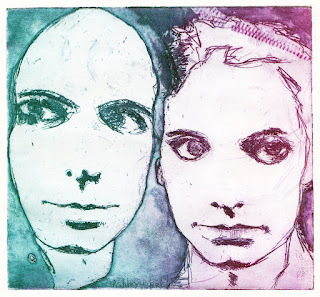 I am a thrifter, a flea, a swap meeter, a tagger, a rummage saler... what would be the proper term for someone like me?... Anyway, I like to spend weekends looking & collecting random old, unusual things at all of the above, where ever they may be. So I bought the 5 hanks she had for another 20 bucks and the lady told me that I was the only person whom expressed interest in them all day! I always get excited when I discover old crafting supplies—yeah, the actual applique (wish I got a picture!) 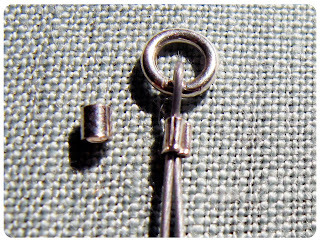 was stunning and amazing—but the idea of a craftsman anally stringing these tiny metal beads, hunched over their worktable, to a piece of fabric, creating an incredibly detailed, intricate labor of love (I hope), then finishing with a few bundles of beads leftover, only to wind up decades later in some other craftsman's hands, ready to create something different with them, just makes them more special—I felt like I scored! Instantly, my mind started brewing up ideas! When I get something new that I really like, I want to look at it... all the time. It's one of the reasons I like jewelry so much, I can wear it and admire it all day long, everyday. ...and it does, but making it turned out to be not so simple! 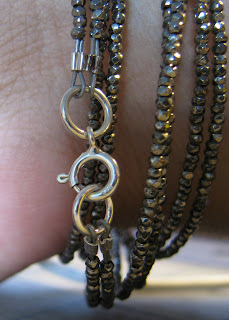 So I had to cut it, lose a wrap around, so I could redo the end crimp bead and add an ordinary clasp. 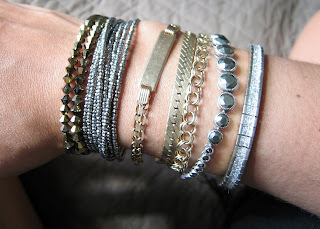 I wore it for a day and it drove me crazy, tangling with all my other bracelets. Back to the drawing boards. 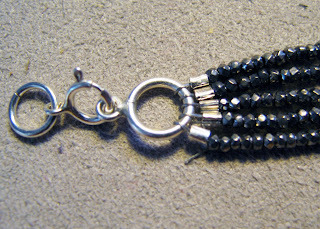 Maybe the wrap around is the wrong way, so instead I tried individual strands attached at each end with a crimp bead to the clasp ring and a jump ring. I got through 5 strands crimped to the jump ring and thought it looked awful! 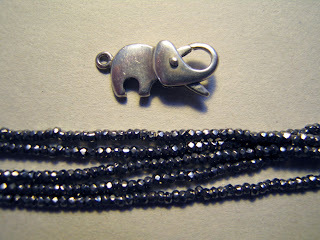 I restrung the beads on a thicker (.019") beading wire (49 wires of flexible strength), made two 29" lengths and attached them to clasp and jump ring. The thicker wire is less likely to tangle with my other bracelets and has a lot more body and form—so instead of a super long wrap-around bracelet, doubling up with the two shorter strands gives the bracelet the look I wanted but not the annoying headache. I am addicted to a few things... one is scarves. I wear a lot of shades- black, grey, white- especially in the winter, but I usually throw on a scarf to jazz my outfit up a bit and to keep my neck warm. 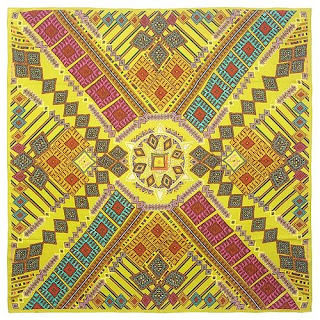 It is way too hot to wear a scarf in the summer in New York, but for some reason I tend to find amazing patterned scarf during this season!